Prior to the New World’s interest in wine, the grapes used to make wine weren’t the focus of much attention. Wine was generally named for the place it came from and most consumers only cared about the price and taste. An interest in the provenance of grape varietals only emerged when curious Americans in the 1970s started to drink wine and demanded more information about what they were sipping. This is when questions about blends really began to emerge: Are blends “cheating?” Are one-grape wines always better? The idea of a blend can be confusing, as the wine name isn’t always clear about what’s in the bottle or how it might taste. This is the reason that wines named for a single grape variety have become so popular—they’re easy to remember, it’s easy to know approximately what you’re buying and they’re easy to find and buy again. But this does not mean that wines from a single grape variety are always superior to blends. Bordeaux, Champagne and Châteauneuf-du-Pape are just a few examples of famous blended wines. All of the above-cited regions are very old and have used the selection of grapes in their vineyards to ensure a consistent product with a specific taste and style. Châteauneuf-du-Pape may hold the record for the most grape varieties allowed in their wine: The red may blend as many as 13 different varietals. Some producers, like Château de Beaucastel, strive to use all 13, while Château Rayas uses only one: Grenache noir. Grenache is the main grape of Châteauneuf and the surrounding Côte du Rhône villages, but other grapes add complexity and diversity and also give producers a measure of insurance against certain weather events and diseases. 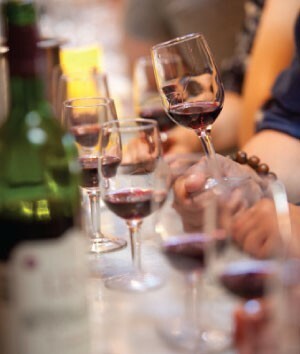 In Bordeaux, merlot and cabernet sauvignon are the main grapes and ripen at different times. Malbec, cabernet franc and petit verdot are also used in Bordeaux and also ripen at different times. Malbec and petit verdot add richness and color, while cabernet franc offers lovely spice and delicate aromatics (depending on how ripe it gets before harvesting). Champagne can be a blend or single variety. Chardonnay, pinot noir and pinot meunier are blended for most Champagne and then there are blanc de blancs which are only Chardonnay and the blanc de noirs—a wine made from the black grapes of the region (pinot noir and pinot meunier). Prior to the 1950s these place names were used to describe wines in New World regions; we could have “Champagne” and “Bordeaux” from regions like Napa and New York. The original regions eventually demanded that other areas stop using their names. Now we have blends with fanciful names that may create confusion. More information on the back labels of wines has made it easier to determine the blend of most wines. And if the label doesn’t have the information, there is always the Internet. Australian winemakers created their own categories for blended wines using all the names of the grapes in the wine on the front label and in order of importance. Grenache-syrah-mourvedre or the shiraz-cabernet or other interesting combinations bring grapes from different histories together in a bottle for a serious or playful wine experience. Some offer great value and others are famed, iconic wines. Le Cigare Volant: A Rhône Blend that is designed to be a Californian replica of Châteuneuf-du-Pape. Current vintage is 2010, a blend of syrah (28 percent), grenache (22), cinsault (17), mourvédre (17) and carignane (16). Opus One: A Bordeaux blend that started as a collaboration between Mouton-Rothschild and Mondavi. Current vintage is 2010 and a blend of cabernet sauvignon (84 percent), cabernet franc (5.5), merlot (5.5), petit verdot (4) and malbec (1). Penfolds Grange: A blend of shiraz and cabernet sauvignon. The blend changes every vintage depending on the harvest from about 85 percent shiraz to as much as 100. Rainbow’s End Family Reserve: A Bordeaux blend of 40 percent merlot, cabernet sauvignon (20), malbec (20), petit verdot (9) and cabernet franc (1) from a little sub-region of Stellenbosch, South Africa, called Banghoek. Wine Trivia: Banghoek means “scary corner” in Afrikaans. This name derives from the density of the local leopard population.